As higher densities in our cities continue to change urban communities, architect Natalia Krysiak turns her attention to the needs of our youngest citizens. The population of Sydney is predicted to double in size in just over 40 years and by 2031 almost half of Sydney’s housing stock could be in the form of high density. With the urban landscape shifting to higher densities, it is inevitable that an increasing number of families with children are choosing to live in apartments and medium density housing. We are already seeing 25–28% of Sydney apartments occupied by households with children and this number is growing in almost all Australian state capitals. With the shift in our urban fabric comes an opportunity to question how we can design new compact neighbourhoods, which nurture the needs and wellbeing of our youngest citizens. Over the past 40 years, there has been a significant decline in children’s outdoor free play and active mobility. From 1971 to 2013, we have seen a 42% decline in children’s active mobility and a vast majority of children today do not meet the recommended minimum levels of physical activity. The increasingly sedentary lives of children has been linked to a rise in childhood obesity (one in four children in Australia are overweight or obese) and behavioural problems. The lack of independent and unstructured outdoor play has also been linked to a decline in children’s sense of control, increased anxiety and depression. Reasons for the decline in outdoor unstructured play are diverse and multifaceted, including stranger danger perceptions, lack of trust in other adults to look out for children, fear of judgement from other parents, traffic dangers, and a lack of local, accessible spaces in which children can play and socialise. 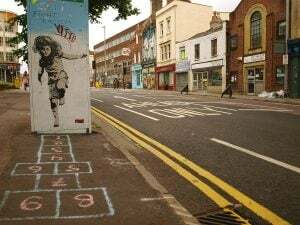 Other shifts in society, such as the increasingly scheduled lives of children, a rise in screen-based play and pressures on academic performance also influence children’s freedoms to play independently within their neighbourhoods. Even though the barriers are complex, the design of the built environment can play a big part in addressing some of these issues. Stranger danger perceptions can be partly addressed through the design of neighbourhoods for passive surveillance, traffic dangers can be reduced by prioritising pedestrians, and accessibility can be improved by master planning safe travel routes for children. Further to this, the enticement of screen-based entertainment can be balanced through the provision of outdoor play, which fosters meaningful connections between children, allowing them to take ownership and responsibility over their environments. Given the complexity of barriers that prevent children from playing in the first place, the design of a child-friendly city goes beyond simply installing additional playgrounds. Neighbourhoods should develop comprehensive strategies, which meaningfully address the challenges of accessibility, ownership and engagement, and span both physical and social interventions. Apart from ensuring big-picture thinking when it comes to child-friendly planning (such as passive surveillance, safe travel routes and accessibility of local schools) comes an even deeper question of how, as designers, we can enhance the everyday lives of children. It is easy to forget the small opportunities for creating joy and intrigue within the built fabric. The average height of a three year old is 95 cm, a six year old is 116 cm and a 10 year old is 137 cm. Imagine if as designers, we meaningfully considered the various scales of a child to ensure that building facades and streetscapes included elements of intrigue and joy for children at their eye-level. Imagine if public toilets had child-sized basins and toilets (as is common in Singapore) and trains had carriages designed for children (as they do in Finland). Imagine if every neighbourhood had a local ‘Play Yard’ or clubhouse, where children can belong and have ownership (as is common in Denmark) and if every city had a ‘local children’s council’ where students regularly meet the mayor to discuss issues that are important to them (as happens in Tirana). Considering that around 20% of our population are children (0–14 years old), it is disheartening how rarely we ask their opinion on the built environment. As designers, we have the opportunity to shape the built environment to enrich the lives of our youngest citizens and enhance their freedom to occupy, alter and belong within their communities. Imagine if every designer, developer and planner was asked a series of simple questions when submitting a development application: Where do the children gather, socialise and play? Where are the opportunities for them to belong and contribute to their neighbourhoods? How is the scale of the child considered? Numerous government agencies, councils and key industry players around the world are recognising the importance of designing cities for children to ensure the long-term viability of compact cities. 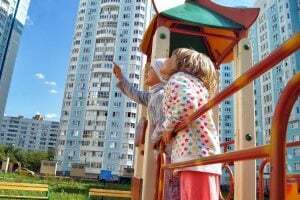 The City of Toronto has recently released draft guidelines Planning for Children in Vertical Communities (2017), and the City of Rotterdam has a guideline How to build a Child Friendly City (2013). Arup consulting has also recently released a report titled Cities Alive: Designing for Urban Childhoods (2017), outlining numerous benefits to global communities and economies which result from child-friendly planning. As our urban landscape continues to densify, we should develop and test meaningful strategies that consider the wellbeing of children and their families. Australian capital cities ought not be left behind. Natalia Krysiak is a practising architect in Hayball’s Sydney studio and has been involved in advocating for child-friendly cities since graduating from Monash University in Melbourne. In 2017, Natalia was awarded the David Lindner Research Prize by the NSW Chapter of the Australian Institute of Architects. Her proposal explores the potential for high-density areas to provide environments for increased play and independent mobility of children. You can read the full report here.